I was born in Gateshead, and moved into the High Fell ward in 1976 where I still reside with my husband, Colin. I am a mother and grandmother. 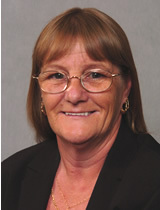 I was first elected in 2004 and have served on numerous committees, groups and outside bodies including Planning and Development, Children and Young People Advisory Group, Sustainable Communities Place Advisory Group and High Fell Children's Centre, Wrekenton Community Association, Springwell Community Association and the Trustees of Thomas Powell Almshouses and Gateshead Parochial Charities. I am a Governor of two local schools, Glynwood Community Primary School and St Oswald's RC Primary School. As one of your three elected members for the High Fell ward. I am always available to listen to any issue you believe I can assist you with. Please feel free to contact me at any time.